Envision a future where everyone has access to affordable, personalized healthcare through sophisticated sensing technologies that put you in charge of your own health. Where sensors and devices recognize and measure your personal health information, provide insights and recommendations relevant to you and communicate that information to your physician. That’s the aim of this competition: a whole new level of personalized, digital health information. The Nokia Sensing XCHALLENGE is a $2.25 million global competition to accelerate the availability of hardware sensors and software sensing technology that individuals use to access, understand, and improve their health and well-being. Innovation in sensing is an important component to creating a means for appealing, usable, smarter digital health solutions. The Nokia Sensing XCHALLENGE will be comprised of two distinct Competitions held between 2013 and 2014. Prize purses totaling $2.25 million will be awarded. View Competition Schedule. Traditional laboratory tests, hospital equipment, and a limited number of machines in a doctor’s office are the primary means to get information about a person’s health today. In many countries around the world these mechanisms are in short supply; even in developed countries it is difficult to come by access to healthcare that is timely, convenient, cost effective and reliable. Yet capturing body metrics and interpreting these readings into valuable insights about detection, assessment, treatment and management of health conditions is very possible. Sensing can be used as a faster, cheaper, easier means to get information that has been limited up to now by the capabilities of conventional testing. Improved test methods and radical new alternatives to blood testing, heart monitoring, imaging, are on the near horizon. Speed the detection of cancer through the use of a highly sensitive electronic nose that detects the presence of early tumors and abnormal cell growth. Assess potential life-altering conditions with an ECG heart monitor connected to a mobile phone, making critical information instantly available to individuals and their healthcare providers. Discover patterns of behavior in an individual’s physical motion that predict the emergence of a disease or medical condition long before it presents itself. In a single exhaled breath collect the diagnostic markers for a range of diseases including asthma, diabetes, kidney disease, lung cancer and stomach ulcers. By scanning the inner eye measure the likelihood of stroke as part of a general retinopathy assessment that can indicate the presence of many other diseases. Leading edge companies, startups and incubator labs are on the forefront of creating and building these new, innovative sensing technologies. What is needed is a pathway and compelling impetus to launch these discoveries into the realm of actual availability for all. Sensing mode: Driving advances in technology such as microelectrical mechanical systems (MEMS), imaging, and microfluidic and nanofluidic lab-on-a-chip systems can lead the way to new forms of chemical, optical, thermal, electrical, biological, and genomic sensing and analysis available anytime, anywhere. Cost and size: Pushing advances in electronics and computing can make many forms of sensing more widely accessible to individuals in their home, work and living spaces. Interlinking: Driving sensors to interface more with other devices as well as the cloud, enabling both convenience and ubiquitous real-time sensing. This is also key to integrating health data with consumer social networks, another powerful dimension that can be deployed to improve health and well-being through peer support. Resource scarcity: Improving the computing, communications and energy resources of sensors and sensing solutions. Computing and machine learning algorithms: Pushing the development of sophisticated software that can enable complex conditions—such as depression or addiction—to be inferred from data. Software has the capability to interpret data from sensors or other existing sources of information and capture insight about the human organism. Trustworthiness: Extending end-to-end system reliability and quality of data and data delivery, both in terms of sensor and network functionality as well as user actions. Privacy and Security: Proactively addressing data privacy, both in terms of how information is being gathered and evaluated, and by whom and when. Regulations, standardization and interoperability: Establishing a forum and dialogue for convening industry standards to address these issues. Checking health signs such as blood pressure, temperature and mobility usually involves multiple tests and can be time-consuming. A chair developed by Sharp is equipped with multiple sensors that can measure a user’s vital signs all at once and save the data to the cloud for physicians to reference. Sharp designed the chair for patients to use at home and is considering adding a videoconferencing system so patients can visit with physicians remotely. “Rather than people who are ill going to the doctor, our idea is for healthy people to think about how to stay healthy, prepare for any emergencies and improve their day-to-day lifestyle,” a spokesman said way back in 2013. Telehomecare is expected to be a future trend. Most current mainstream healthcare products and technologies focus on the use of wireless radio-frequency links for the sensors and measurement instrumentation. However, a major disadvantage is that home users of these telehomecare technologies are still required to use different instruments to monitor vital signs such as blood pressure, body temperature, and blood oxygen saturation, which complicates the use of telehomecare. ITRI’s Smart Health Chair integrates the sensors for all important vital signs, and embeds them into the patient’s chair, thereby enhancing convenience for home use. Data for five important signs are logged: body weight, heart rate, blood oxygen, blood pressure, and workout level, without the user even noticing. The collected data can be relayed back to a processing center in the cloud or be shared with concerned family members. With the help of the patient’s social group, health management can become easy and interesting. 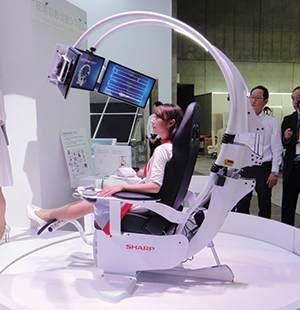 Sharp has developed a health care support chair which combines a range of sensors for checking the user’s health. It can simultaneously record your blood pressure, temperature, body motion, and pulse waveform, storing the data in the cloud.